The Continental Cross Country LX 2 is part of the 4x4 range from continental. It?s a relatively new comer to the market and performs well in the wet and dry. 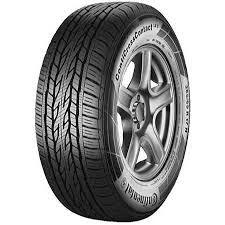 The handling from the tyre is responsive and accurate giving complete control when driving at high speeds. The tyre performs very well on the road and is more than capable off road. Although this isn't an out and out off road tyre it will work well as and when you need it.